View the board list and see current members, and consider joining yourself! 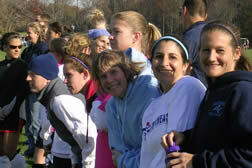 BFHA members enjoy a day of fall field hockey. The Baltimore Field Hockey Association (BFHA), based in Baltimore, Maryland, is a volunteer organization that has a mission of promoting the growth of field hockey in the Baltimore region for high school, college, and post-school players. We have varying levels of play (fun and competitive) and both women and men are welcome. BFHA sponsors high school and adult field hockey leagues, play days and tournaments throughout the year; see the Tournaments section of the site. The Baltimore Field Hockey Association (BFHA) was founded in 1923. That's right, over 90 years of the Baltimore Field Hockey Association! Over those 90+ years, BFHA has impacted the lives of thousands of people – including all past and present members, teams that attend our tournaments, coaches, officials, and countless other spectators and supporters.